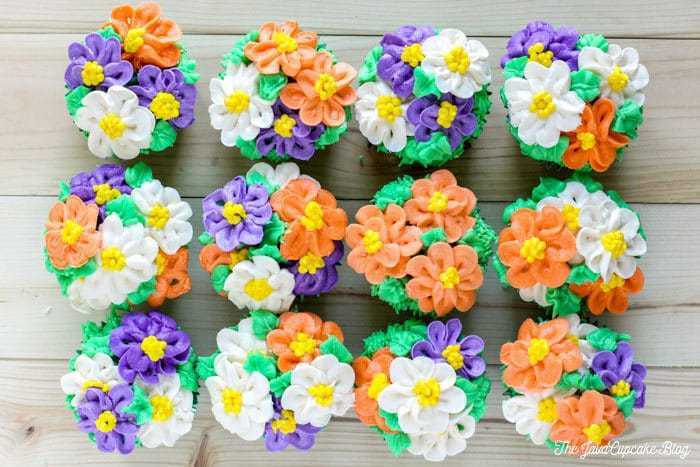 Spring is here and these Flower Pot Cupcakes will make the perfect dessert for a garden party or Spring soiree! I subscribe to Cake Style on YouTube and one of their recent videos featuring piped cosmos flowers placed onto a layer cake inspired me to make these cupcakes! These cupcakes aren’t for beginners, unfortunately. You’ll need to know how to use a piping bag and a some experience working with buttercream. I really love how the Sweets & Treats Boutique green dot liners really add to the overall look of the cupcake! I’m a firm believer that the cupcake shouldn’t just look pretty on top where the frosting is, but the it should be cute from top to bottom! 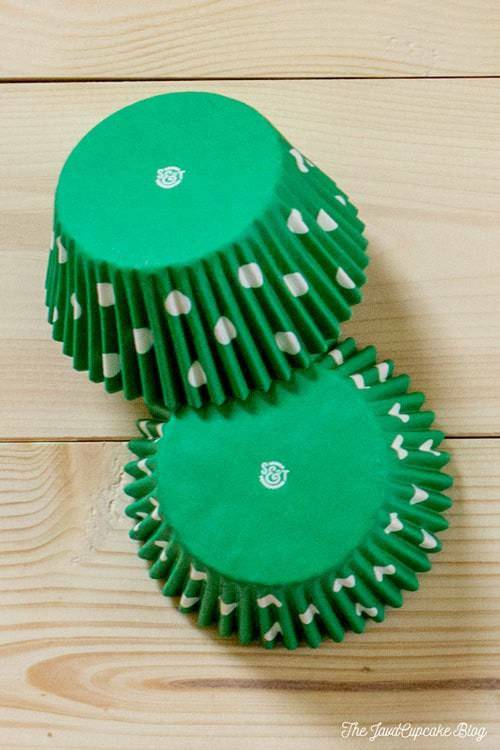 Prepare the green cake mix as instructed on the package and bake them in the Sweets & Treats Bake Bright green dot liners. Allow the cupcakes to cool completely before frosting. Separate the buttercream into two… 2/3 in one bowl and 1/3 in another. Separate the 2/3 buttercream into three equal parts. Leave one white and color the other two any color you want for the flowers. Separate the 1/3 buttercream in two parts, 2/3 and 1/3. Color the 1/3 yellow and the 2/3 green. 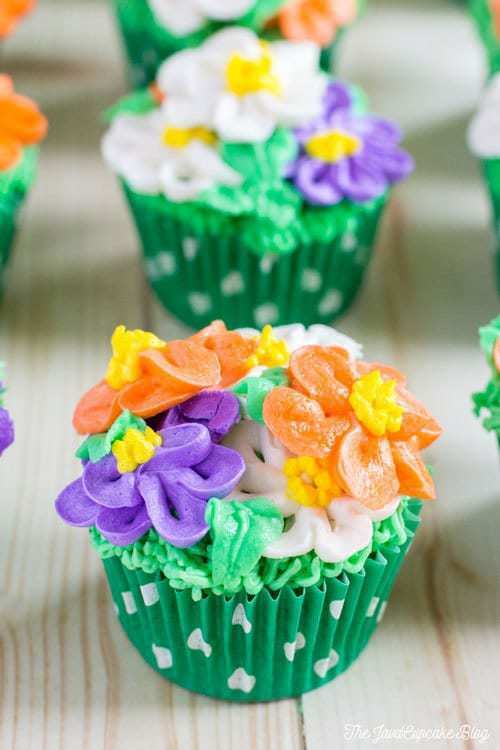 Fit the piping bag with the #102 small petal tip and fill the piping bag with the first color. Freeze all the flowers until they are firm. Fill a piping bag fitted with the #67 leaf tip with green buttercream. Pipe dabs of frosting onto the top of the grass. This will act like the glue to hold on the flowers. Pipe leaves with the green buttercream around the flowers. Repeat until all the cupcakes are covered. 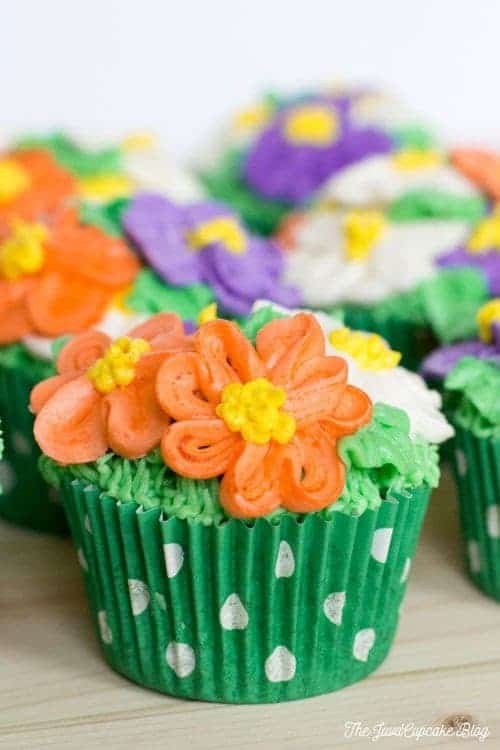 NOTE: The flowers get soft very quickly, so keep them chilled until you are ready to place them on the cupcake. I am so super in love with how well these cupcakes turned out. Piping the flowers first, chilling them and then placing them on top created the perfect little pot of flowers! 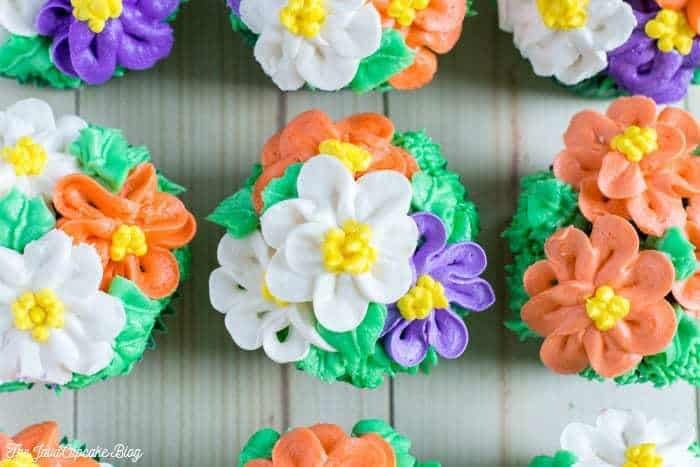 When the buttercream flowers come to room temperature, they meld onto each other making it impossible to tell how they were place on the cupcakes! I had people amazed and how I made these! 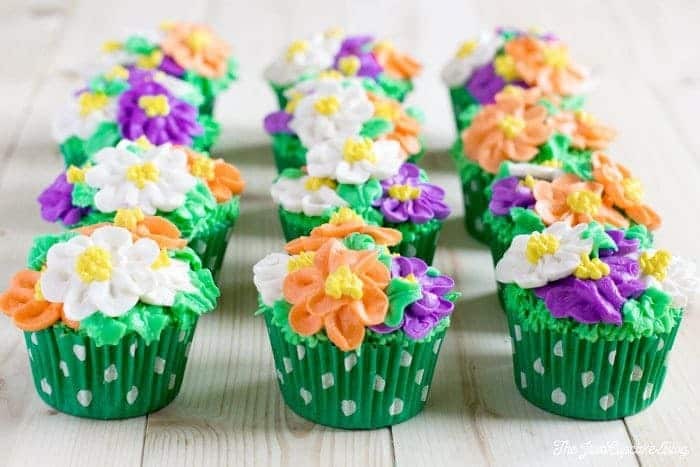 So whether you’re hosting a garden party, a bake sale or just want to make something adorable, these Flower Pot Cupcakes are perfect for all your cupcake needs! Beautiful! Thanks for the tutorial video. Hope you’ve been enjoying being back in the states. These are so cute!! I’m so impressed! Absolutely beautiful! You must have plenty of time to do all these brilliant things!